Kidney cancer (also called renal cell carcinoma or renal adenocarcinoma) is a disease in which cancer cells are found in the lining of very small tubes in the kidney. These cells can destroy the lining and spread to other parts of the body. The specialists at GW Cancer Center’s Urologic Oncology program offer comprehensive diagnosis and treatment options for patients with kidney cancer. We perform more minimally invasive surgeries for kidney cancer than any other center in the region. 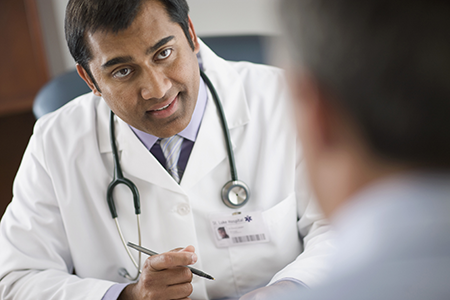 Our caring specialists will help you understand and manage a kidney cancer diagnosis. Because we know every patient is unique, we take the time to develop an individualized treatment plan that will deliver the best outcomes. Our program offers a clinic where patients can meet with several cancer specialists in one visit. Our team of specialists work together to gather information using advanced detection tools. We then collaborate to analyze the information and create a treatment plan that will deliver the best results. Treatments may include participation in life-saving clinical trials. Patient navigators support patients who have been diagnosed with kidney cancer. Navigators steer patients through the process. They even help them with the financial aspects of a cancer diagnosis, such as working with insurers. We offer a multidisciplinary clinic where patients can conveniently interact with several specialists in one visit. Our team works together to provide an accurate diagnosis and to create the best treatment plan. GW Cancer Center offers specialized screening and treatment for kidney cancer. We perform more minimally invasive surgical procedures for kidney cancer than anyone in the region. We offer a clinical trial to understand how immunotherapy can be beneficial for patients with kidney cancer. Immunotherapy enhances the body's ability to fight cancer. We offer da Vinci® robotic surgery. Using tiny incisions, we can remove the tumor mass or the entire kidney, and surrounding tissues and lymph nodes. The da Vinci® robot offers surgeons more precision to minimize potential side effects. This minimally invasive procedure may result in less scarring and shorter hospital stays.